• Join a Bible study group in your area. There may be one at your church or somewhere else in your community. If you don’t know of one, you can look on the Bible Study Group Bulletin Board at Living Proof Ministries. • You could study by yourself or with a friend. You will need the printed group member book and access to the videos, or the audio component of the videos. Now, you know there are all kinds of copyright laws and things that keep me from being able to share Beth’s videos and the printed study on my blog. I can’t run over to YouTube and throw the video on there, and I can’t copy the study for you on my blog. However, you can go to LifeWay and download, for a fee, the videos. There is also an audio component available at LifeWay and on iTunes. The printed member books are available for purchase online through LifeWay and at Lifeway stores. By the way—I do not work for LifeWay Christian Resources or Living Proof Ministries. I am not being paid by either of these organizations. 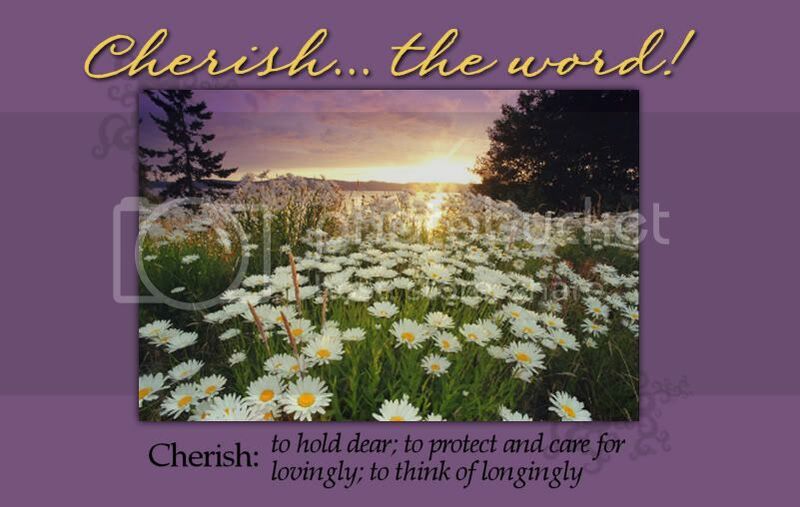 I simply wanted to host a blogging Bible study activity at Cherish…the Word! I have completed several of Beth’s studies, have been privileged to be at the taping of some of them, and love her as a sister in Christ. I was excited when this update was available and chose to use it for this experimental Bible study journey. If you have ever read the LPM Blog, you know that Beth and her daughter, Amanda--who manages the blog—do love their “blogging Sistas!” If you have not stopped by their blog you have missed a blessing. I suggest you hurry over there. And--After all, I did discover the wonderful world of blogging through the LPM blog! You can read about that here. I did let Beth know about the idea for this blogging study. Her response was typical Beth. Something about the hairs sticking up on her arms and chill bumps! If you “know” her, you understand that. She ended with, “Myrna, I cannot say AMEN loudly enough! YOU GO, GIRL! My real life study group is going to meet in my home on Monday evenings. I will put up my discussion notes from the week’s study by Wednesday 12:00AM EST (that’s Tuesday 11:00 PM where I live). I will have a Mr. Linky up. You can sign up on Mr. Linky for us to come back to your place. You will share a summary of what you learned in your own study, a wrap-up of what people in your group had to say, pictures of irl friends at your group meeting (with their permission, of course), or whatever creative thing you come up with that will enrich our Bible study. You can grab the Fall Bible Study Button for your site. When we get started, I will ask that you leave a comment on my blog when you link up. Each week I will offer one or two discussion starter ideas for the next week. You are certainly welcome to base your posts on your personal perspective, or that of others in your group. Some people will appreciate the discussion starter suggestions; some will have something else relevant they prefer to talk about. Either way works for me. I would like to emphasize that I want this endeavor to glorify and honor the Lord. You may want to tell a funny story about your Bible study group, share an anecdote, etc. And that is OK—as long as you have permission from you group, that’s your choice and responsibility. We definitely want to have fun and fellowship along the way! But, please, remember that this is a Bible study, and we want to focus on what we have learned from the Bible as we have fun with our girlfriends! Come over to Cherish… the Word between September 5-September 11 for any updates about the study and for the discussion starter ideas for the Introduction session. And--BTW--Come back tomorrow for another bit of news! I just can’t wait to get started! I’ve been thinking and praying about this for a long time. Now I have committed to it by posting the details. I invite you to join me, and let’s just enjoy what God has in store for us! Here’s the schedule for Fall Bible Study at Cherish…the Word! November 21 My home group will likely take the week off because of school holidays. If we choose to do that, we will finish up the next week. If we take the week off, I will plan a special Bible Study activity for blogging friends that week. Stay connected to find out what we will do! Remember to come back here tomorrow--A surprise for you! What a fabulous idea! I love that you are doing this. I am going to pray about joining you. Not whether I need to decide to study with you and Beth, but whether I can add it to the study I'll be teaching. I'll let you know. But I think it is wonderful!! I won't be able to participate in the bible study, but I hope it's a great study for y'all. I just think this is wonderful, Myrna...I'm sure it was an idea given to you by the Lord. Yes, I'm very excited about this!! I was looking on lifeway's site and I see where there are the audio CDs, but the DVDs are only available with the group kit. Am I understanding correctly that the CDs are just the sound component of the DVDs? I think I'm on board, but I confess the fee for the video downloads is a bit daunting for me -- maybe I need to find the class locally, instead! You can see the downloads here. Thanks for hosting this, Myrna. I look forward to gleaning wisdom from others! Hi Myrna! I just stopped by your blog to learn about the fall study. I am actually taking it at our church on Monday nights, but may "pop in" every once in a while to particpate with you guys as time allows. I adore Beth Moore and look forward to learning about what God has in store for our ladies this fall! Blessings to you! because of my work schedule this might be the perfect way to do this Bible study. This was the first one I did but I will gladly go back through and learn everything I missed and maybe some of what I forgot. That sounds so cool! BooMama sent me this way. I would love to do the study, but 1) I don't have a blog yet and don't think I will have one up and running that soon (maybe though) and 2) while our church has several of Beth's studies that is not one of them. I am planning on doing a study soon at my home. Maybe if this goes well and you do another one or someone else does one, I'll be able to join in. But I think it's a fantastic idea and I hope ita ll goes well.